Wildlife damage repairs are a vital part of the wild animal control process. Many people don't seem to realize just how vital this step is. The principle is simple: if you've got animals in your home - such as rats in the walls, raccoons in the attic, squirrels in the eaves, whatever - they entered your house through some opening, some hole in your architecture. It may be an existing hole, perhaps a fault of the home builder, or the animal may have clawed/torn/chewed a new hole of its own. 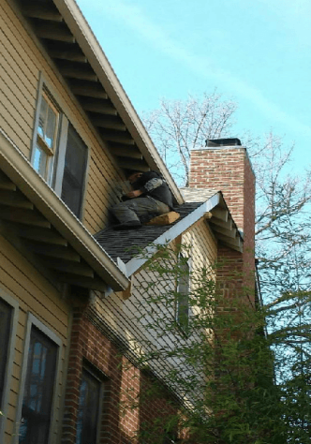 The point is that the animal wanted to live in your attic, so it found a way in - now the only way to permanently solve your problem is to make sure that these holes are found and sealed shut! When animals live in your house, they're not there 24/7. What would they eat and drink? The animals go in and out of your house. They're just using your attic for shelter, kind of like a big, warm, giant tree. They've got to go outside to get water and food. Thus, they go in and out of your home. If you've got squirrels, for example, they'll sleep in your attic at night, then rise early in the morning and go outside to forage for food. They'll often make several trips in and out of your attic each day. If you've got raccoons, they'll sleep in your attic during the daytime (often it's a female raccoon nursing its young during the daytime) and then at night they'll emerge to go forage for food. Rats often follow a similar pattern, but they'll go in and out at all hours of the night. They usually don't stray very far from their home base. In fact, if they find a food source in your kitchen, they may not go outside at all. Look at the photo to the right - raccoons were entering the attic through this torn-open soffit hole. After I trapped and removed the animals, I sealed it shut by bolting in a new soffit cover. This is an example of a simple repair, but it's necessary - if that hole was left open, what do you think would happen in the future? More animals! All of our wildlife damage repairs are performed with the highest degree of professionalism. Believe me, I've seen the work of fellow wildlife trapping companies - I'm often called in to take care of the problems they've failed to solve. I take care to do the repairs correctly - I want them to be 100% critter-proof, I want care taken to ensure no damage to the home - keeping in mind important issues such as attic ventilation and water drainage, and I want the repairs to look good. I've done work on every kind of home and every kind of architecture. In this photo to the left, I'm closing off the open areas around the perimeter of a Spanish barrel tile roof. I'm screwing in a steel screen to block off a gap between the gutter and open tiles that rats and squirrels were using to enter the house. It takes real attention to detail and a mind toward professionalism to make the repairs solid and attractive. In almost all cases, my roof repairs can't even be seen from the ground - I aim to restore the home to its original condition, only better - now totally sealed against animal entry, for good. It takes a lot of experience and knowledge of architecture and knowledge of wildlife in order to make sure a house is 100% sealed against wild critters. If just one area is left open, if I fail to find just a single spot that animals can take advantage of, then new wildlife will be able to get into the home. I specialize in inspecting every last square inch of the building in order to find all of those secret spots that animals use to get in. I then find that last hard-to-reach and hard-to-see area, and seal it shut to solve the problem. No matter what I have to crawl into, over, under, or through, I'll reach those spots that the animals use as a doorway to your attic. To the right, there's a photo of me replacing an open soffit. A roofer would have charged at least quadruple what I charged to install brand new soffit, and I do it better than a roofer does - I bolt it in to make sure that raccoons can't simply tear it out. I don't mind working under houses, hanging over the edges of ten story buildings, squirming my way through tight attic spaces that no one could reach: you name it, I've fixed it. I frequently work on homes at which the frustrated homeowner has already hired several other companies with no results. I have all the right tools for the job - from flexible drill bits to long-barrel sealant devices, I can reach and seal all of those impossible to get to nooks and crannies. I make sure that the repairs are done correctly. For example, rodents such as rats and squirrels love to chew. They also sniff the air and detect airflow coming out of the attic - they sense the change in odor, temperature, and humidity, and they know that there's a nice place inside in which to live. I not only seal off any rodent entry holes with steel - which they can't chew through, but I also use a sealant to block off that air flow, so that they don't even know about it and attempt to chew. I've learned over the years which types of repairs are necessary, and how to do them correctly in order to permanently keep out the wild critters. The repairs are a vital part of the nuisance wildlife control process. In many cases, I simply cannot perform the job correctly if we don't seal off the entry holes. For example, if you've got squirrels in your attic, I usually seal off all of the spots on the roof through which they can enter, and I identify the main point of ingress/egress. I then mount a special repeating trap right on that hole, and it catches every single squirrel as it comes out. I couldn't use this method if I left other entry points all over the roof. Gaps in roof vent screens, soffit screens, areas where eaves meet against the roof, ridge caps, unfitted plumbing stacks, gable vents, there's usually all sorts of areas that animals can use to get into a house. There's rarely just one spot. Our work ensures that we not only trap and remove the current wildlife problem, but that you won't ever have such a problem again.